You have already seen the skirt-on-a-camisole. Today I introduce -The Overblouse. The idea of this overblouse is to fit over the camisole and complement the skirt. In line with my charcoal/magenta/turquoise colour scheme I bought two metres of emerald-green wool crepe from Simply Fabrics. I asked what I should use for interlining and had advice from both Helen and Red Point Tailor that silk organza was the thing. I have heard that before but when I enquired as to the price (at McCullogh and Wallis) I nearly fell over. I bought half a yard and have been using it as a pressing cloth. Because I was using wool rather than the linen suggested for the Overblouse I decided to skip the organza interlining. Instead I used some nice green Habotai silk as underling. 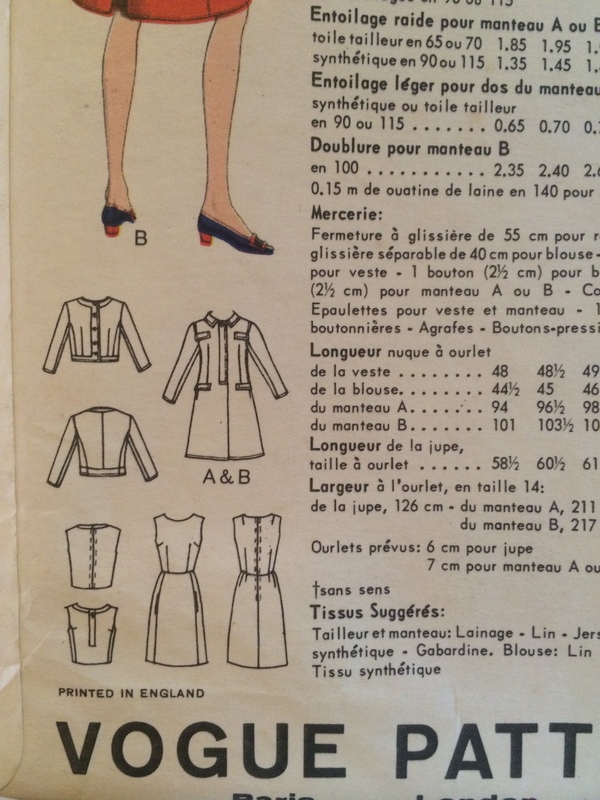 I did consider simply lining the overblouse, but as it is worn over a lined camisole I thought that would be like wearing belt and braces, and then another belt. So here was my chance to try underlining (ie using the fashion fabric and the lining fabric as one throughout the construction). 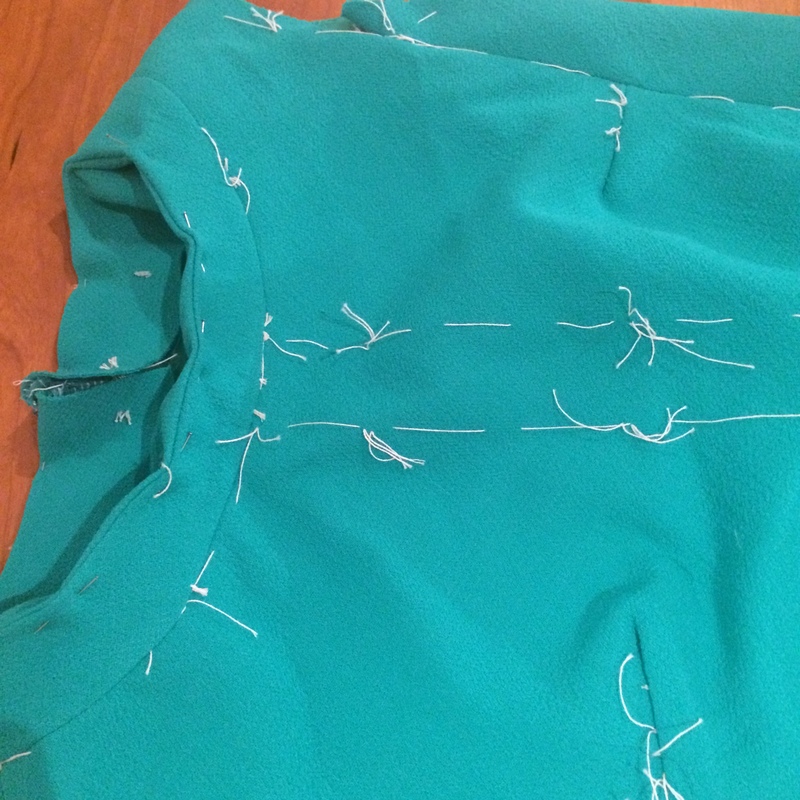 The interlining is attached on the backside by basting along the sewing lines. It makes making up fairly easy. 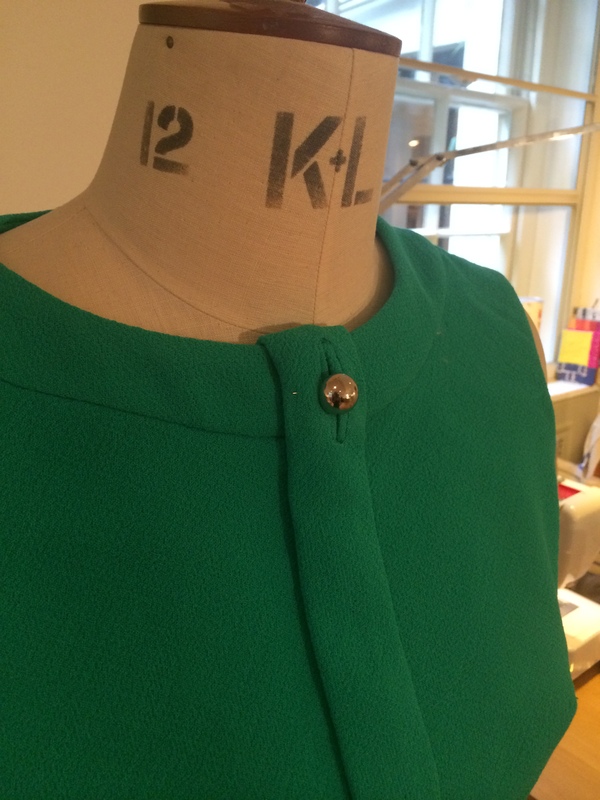 The neckband was applied, and I inserted the zip not once but twice…. Initially I inserting (by hand) a regular zip and only at the end realising I should have used a separating zip. When I checked the pattern envelope I realised it has specified a 12″ separating zip. I rushed into McCullogh and Wallis and got the 12″one (in neutral beige) , realised it was too short (I had lengthened the top by one and a half inches) so I bought a 14″ one from Sharon on Clitheroe market, and re-inserted it. It needs to have hooks and eyes attached to the neck-band. I made the button-hole as specified but it is too large and ugly. I stuck with it rather than redo it, but it dwarfs the button I have chosen. I think perhaps a bigger button as suggested on the pattern (1″) would be better. Now I can move on to the jacket. Lovely! Yes..I agree…it needs a larger, showy button. I just finished making Vogue 1420 in a reddish/orange wool crepe…and was very satisfied with the result. I received lots of compliments last week when I wore it….so that’s reassuring! I am completely self-taught….having never taken any courses. Oh that pattern is on my list too! It is a faithful copy of some of the older CC jackets. I am sure you will find V 8804 (which I made and blogged about, and is an older pattern so many people have made it) is made in much the same way. The instructions were very full (that is partly why there are so many steps – each is explained in detail). I recommend looking at the thread on Artisan’s Square, particularly Ann Rowley’s work. I think if you follow the instructions carefully you will certainly succeed with this pattern. Would love to see some photos of your work. Beautiful colour ! I also agree for a larger button. Is it cut on the bias ? I had never seen a separating zip in the back. Isn’t it hard to pull it up ? This whole VPO 1650 outfit really needs a maid to help you into it. This is couture, not a jersey sweat shirt! I can do the zip – its a bit like putting on a bra – but it needs a bit of a wriggling action. 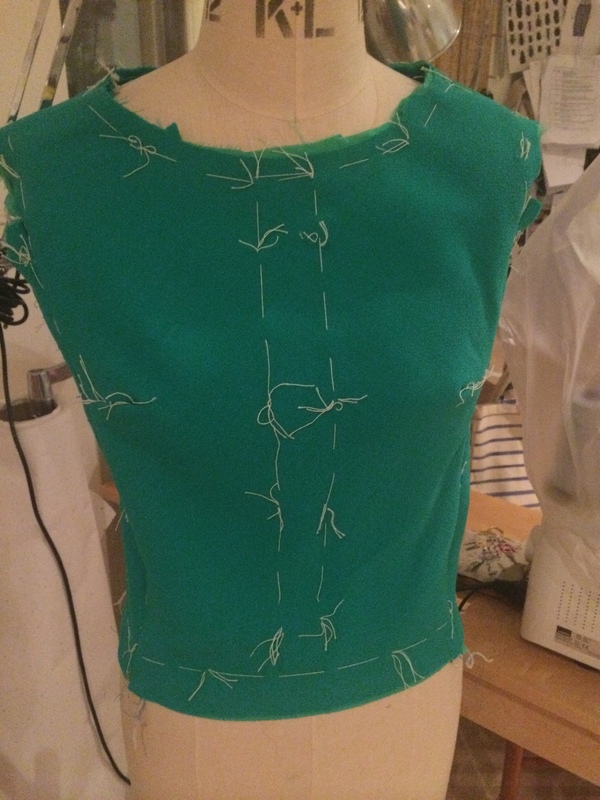 Yes, it is cut on the bias Karine, but stabilised by the silk lining. Very nice [of course]. Definitely a bigger button, it’s basically doing duty as a brooch after all! As for silk organza- loads of us on TSF buy it from ebay, a Chinese [I think] seller. It’s good quality, and considering that 3 years ago, before doing the Couture Dress course on Craftsy, I had never used it, I consider it indispensable now. 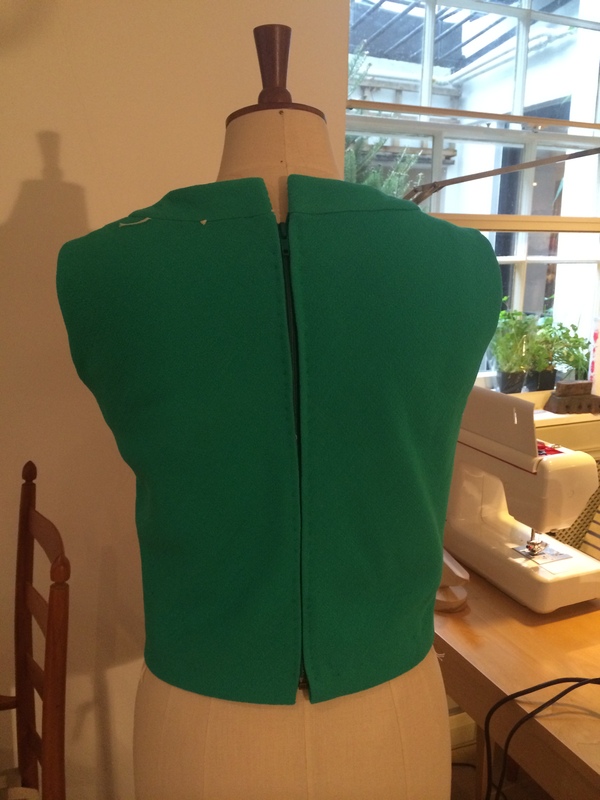 Even all the snips and fragments are kept to reinforce V necks, stabilise shoulders, or back buttons. Great value for money. eg http://www.ebay.co.uk/itm/100-Pure-Silk-Organza-Bridal-Fabric-White-Yardage-/231070080670?pt=LH_DefaultDomain_0&hash=item35ccd99e9e Stock up! Yes I agree it is effectively a bit of jewellry, which I may do instead. The little button is just a stand in. And thanks alot DF for the eBay link. I’m on it! I love the look of the bias cut with that panel down the front and I LOVE the colour. Yes, a statement button I could see on this. The comments are very interesting to this newbie.